The problem with learning to paint is, where do you begin when you’ve got so many ideas but don’t know where to start? Secretly you suspect to create an accomplished still life, things have to get complicated, so when you attempt your first painting, your setup is elaborate. Too many colours – too many objects, resulting in a piece that falls short of your expectations. The acrylics dry too quickly, and you just can’t get the blending or the colour mixing right. But, there is another way. I’ve created this project e-book because I’m passionate about still life’s and I want you to succeed. I’ve designed 3 simple painting studies, manageable for a beginner or those short of time, that I’ll guide you through from start to finish. It will develop your observational skills and add three-dimensional depth and richness to your still life paintings. I’ve deliberately taken an impressionistic approach throughout so you can’t get distracted by the details and lose momentum. The projects will help you to ‘loosen up’ and create an expression in your paintings whilst the step-by-step instruction will keep you on course. You’ll gradually build up skills in a logical sequence, gaining an understanding of the properties of paint and how colour works together in paintings. I demonstrate using a foolproof palette knife system, so you can achieve harmonious colour mixes in your paintings and as you work through the progressive steps in this book, you’ll feel confident behind your easel. You’ll learn classical principles that are the building blocks of all great paintings alongside invaluable tips that I use in my everyday painting practice. It doesn’t have to be a masterpiece; it just has to be your masterpiece, with your energy to create a painting that you can proudly hang on your wall. PLEASE NOTE: This is a digital e-book, you will not receive a paper copy through the post. This Still Life Acrylic Project Book is a brand new, downloadable PDF E-Book designed to help you understand light and shadow and create better acrylic still life paintings. Throughout the lessons, I’ll guide you through 3 full-colour acrylic paintings from start to finish. I’ve broken each lesson into bite-size pieces, so you can complete each stage of the painting within a 2-hour window, something you can easily follow, even if you’ve never painted before. You’ll learn how to mix and match colours accurately, observe colour shifts in the lights and shadows and create convincing subjects. 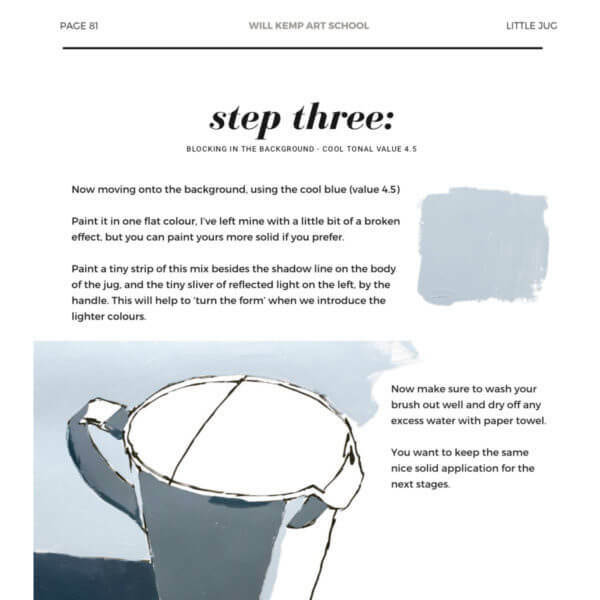 I’ve included an introduction to the materials you’ll need, along with reference photo, line drawings and clear colour swatches to use as a guide. By the end of the book, you’ll learn how to filter your objects, look for relationships in stories, scale, size and the importance of planning a colour scheme, knowing all the same principles will apply to future more complicated arrangements. What’s in the Project E-Book? 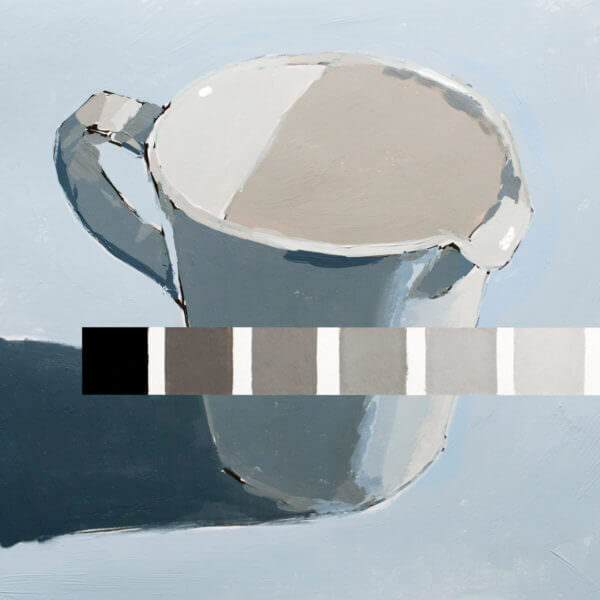 This project book takes you right back to basics, building your understanding of how light and shadows ‘work’, one of the biggest breakthroughs for students struggling to create realistic 3D still life paintings. It’s a practical book that focuses on demonstrating clear, simplified techniques. 3 x still life acrylic paintings, I demonstrate each technique on a painting measuring 8 X 10-inch & 8 x 8-inch, taking you from drawing, right through to the final brushstrokes. Detailed step-by-step instruction with photographs, in bite-size project sections, so that you can follow along at your own pace. 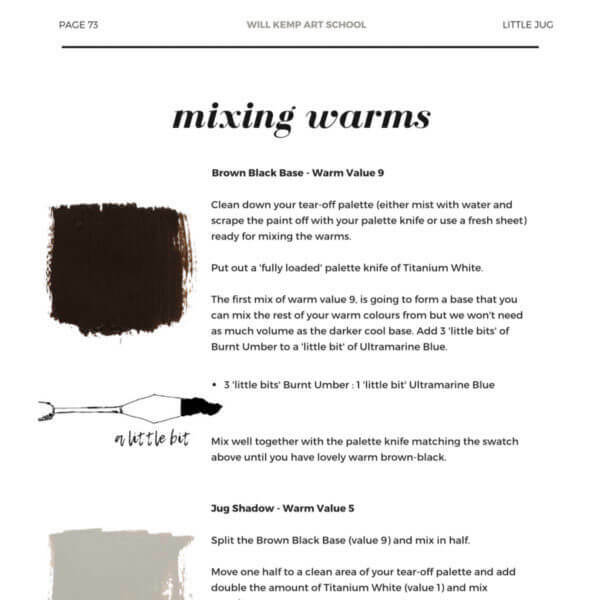 Downloadable line drawings, full-colour reference jpeg images, colour swatches with recipes so you can easily match your paint mixes. An introduction to the materials needed for the projects. Looking at a simple form and how to create convincing three-dimensional shapes within our still life, focusing on lightfall and shadows. 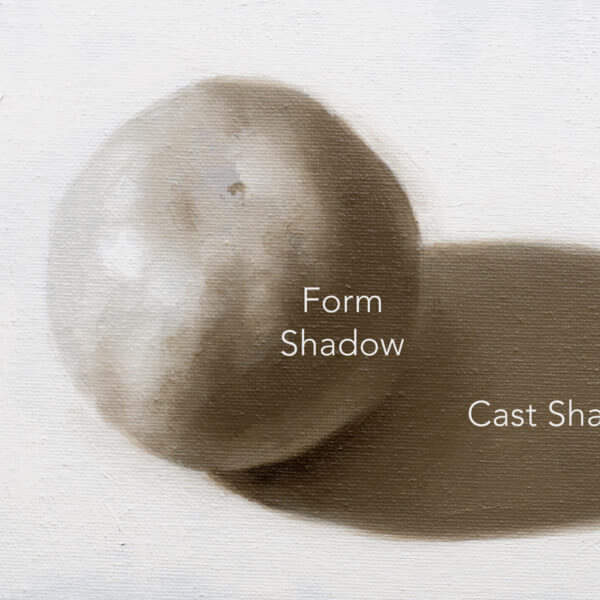 A two-tone preliminary study combining cast and form shadows as one. Often the first sketch is the most effective at conveying the sense of form rather than an overworked, detailed drawing. In this exercise, we’ll make a clear distinction between light and dark, helping to prevent the separation from becoming muddled. 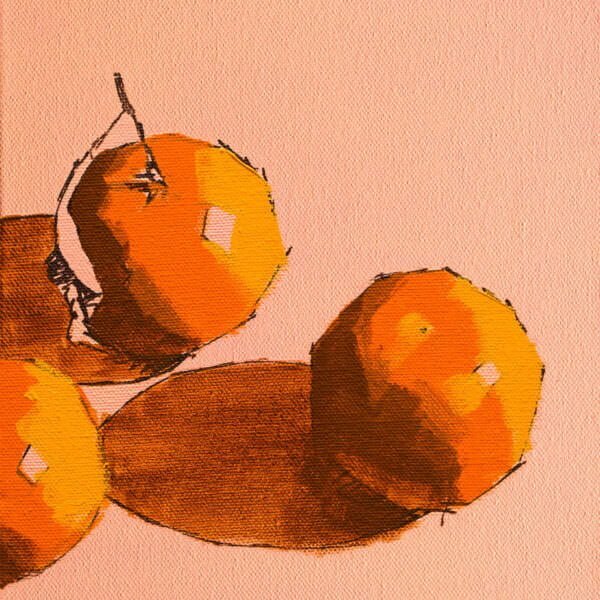 This painting lesson of a group of clementines allows us to enjoy colour and develop a more fully finished painting. We’ll create round objects with minimal blending using solid blocks of colour by establishing value changes using confident impressionistic marks. In this little jug painting lesson, we expand on the importance of value. We work on a light object surrounded by bounced light, with colours in the shadows. 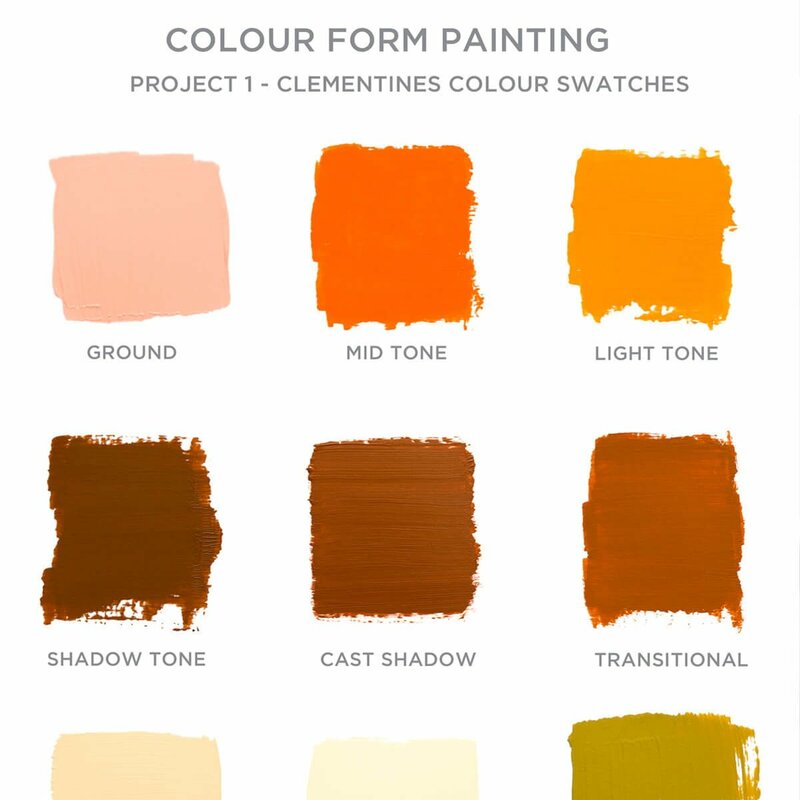 We mix a warm and cool palette and isolate colours to create a premixed tonal map. In our final still life painting, we work within an analogue colour scheme and bring all our observations of form together. Fresh and light, using textural paint application and small shifts in hue for a more challenging piece. This Still Life Acrylic Project Book is a brand new instantly downloadable PDF E-Book. You will receive a 100 page PDF document with supporting reference images to your inbox. To learn the most, you need to see each stage of the painting, have a good guide to work from and have accurate colours to match. So alongside drawing guides, colour mixing recipes and colour swatches, I’ve taken care to photograph every key stage from my perspective so you can clearly see the progress of the work, exactly what I’m doing as we go through the entire painting process. 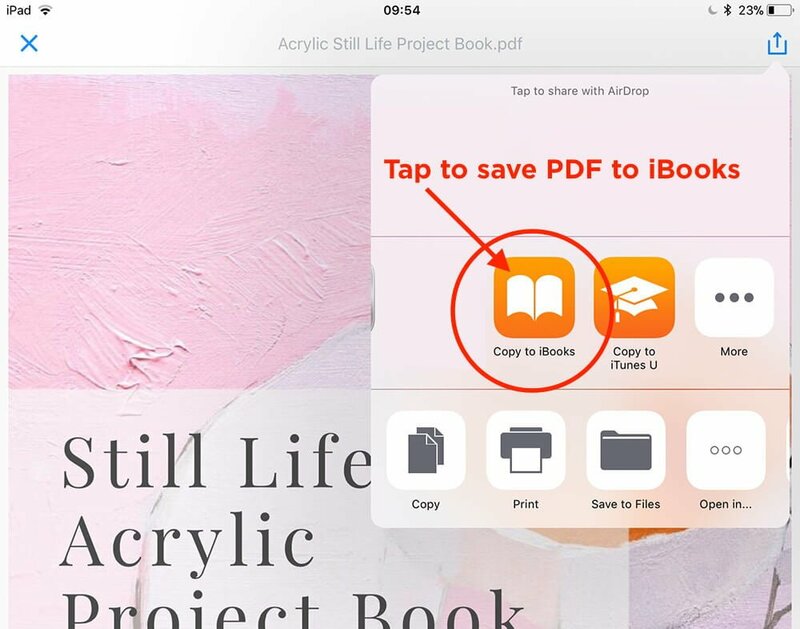 If you have an iPad or Mac, you can access your PDF’s through the built-in iBooks app. iBooks comes pre-installed on all new iOS devices, but in case you are running an older version of the operating system, you can download iBooks for free from the App Store. On the Safari browser, tap the share icon . 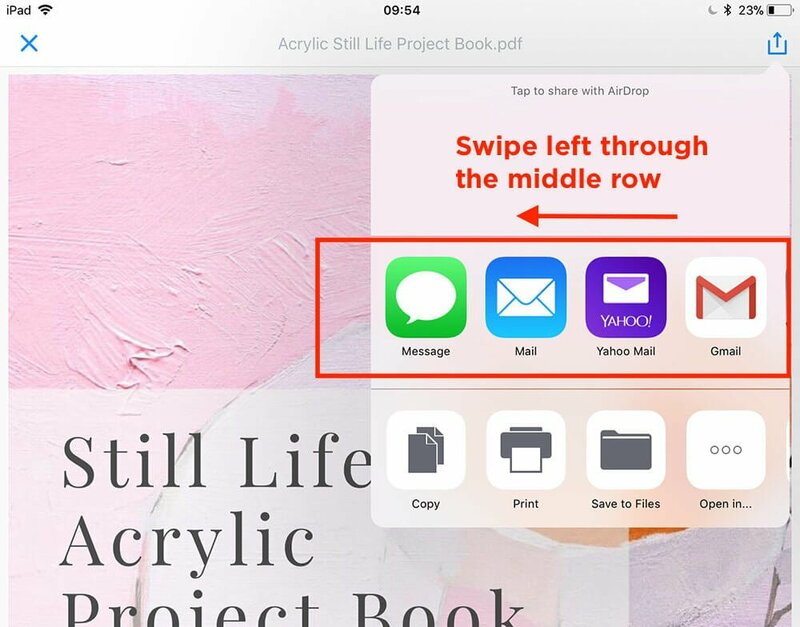 Swipe through the middle row until you see the orange iBooks logo and choose ‘Save PDF to Books.’ (more instructions from apple here). Are there any courses you would recommend before this course? Is there a time limit for the links to the book? No, the book is a downloadable file, once downloaded it is yours to keep forever. If you change computer in the future just drop me an email and I’ll send you through some fresh links. Yes, you can download to an iPad via ibooks and you can download to multiple devices. How do I download a PDF to iBooks on an iPad? If you have an iPad, you can access your PDF’s through the built-in iBooks app. 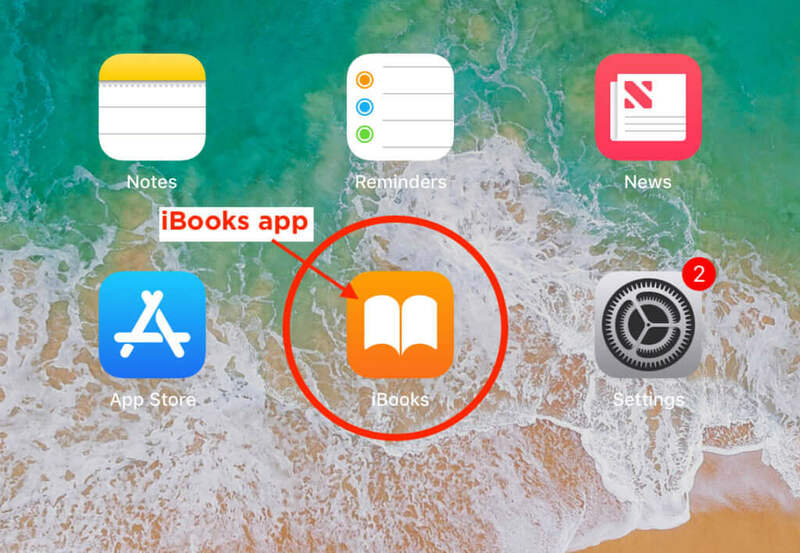 iBooks comes pre-installed on all new iOS devices, but in case you are running an older version of the operating system, you can download iBooks for free from the App Store. On the Safari browser, tap the share icon top right of the screen. 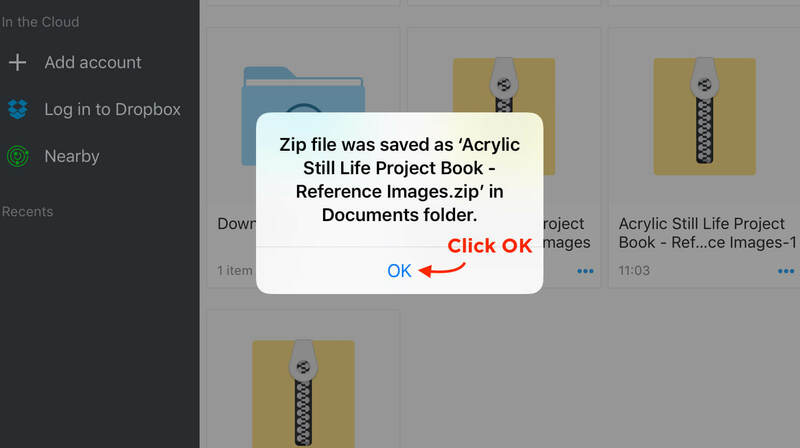 Choose ‘Save PDF to Books.’ (more instructions from apple here). 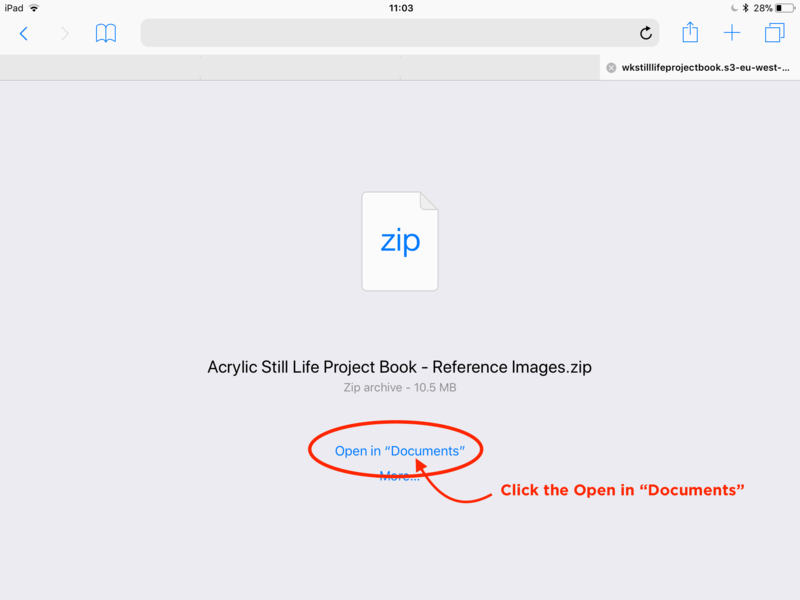 To open and save the .zip files on an iPad, I recommend using the Safari Browser and Documents app. 1. Install the free Documents app to your iPad. 3. 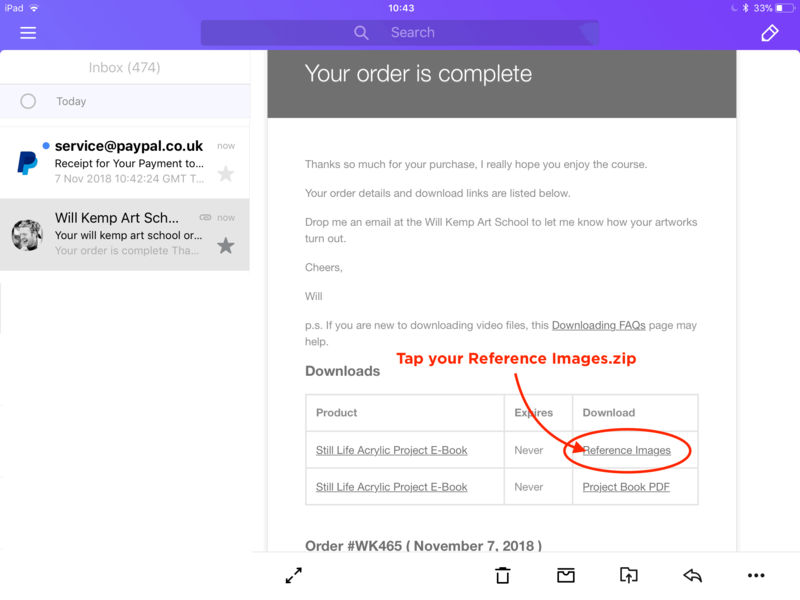 Go to your email and open your Order Receipt that contains all your Download files. 7. Double tap the zipped folder to unzip. 8. Double-tap to open the folder. 9. 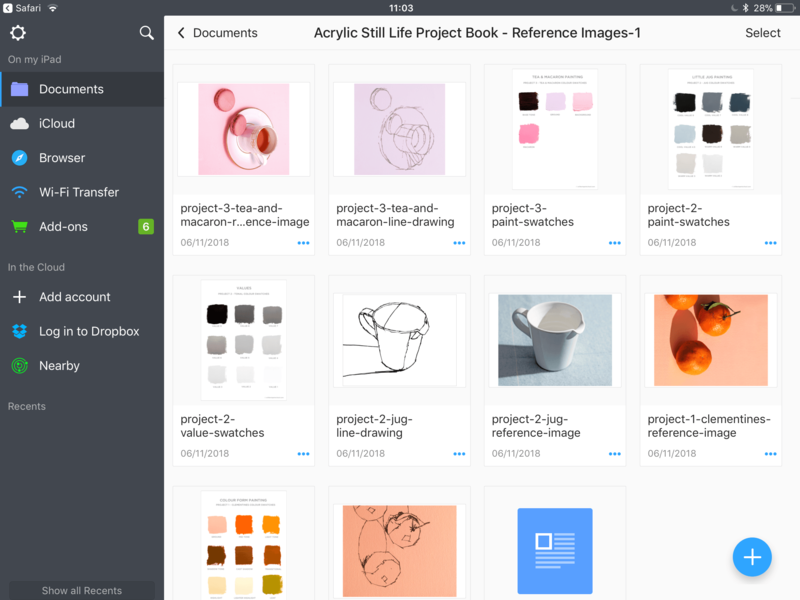 You can see now see your reference drawings and images, whoo hoo! Not at the moment, this is a Still Life Acrylic Project Book downloadable PDF E-Book. Yes, there are reference images in jpegs and line drawings to work alongside from. If you follow the lessons in progression then by the end of the course you will have three finished still life paintings, a group of clementines, a small jug and a teacup and macaron. Each completed with three different styles of colour palette.